Twenty-five ships went down in Lake Superior during the storm of November 28, 1905, including the Madeira, whose wreck helped plead the case for a lighthouse at Split Rock. The Madeira was under tow of the William Edenborn; the Edenborn’s captain cut the tow line thinking it would be safer for the Madeira. It wasn’t. The ship struck Gold Rock, north of where Split Rock Lighthouse now stands. Crewman Fred Benson grabbed a coil of rope and climbed a sixty-foot cliff while the storm raged about him. He then dropped the rope to the Madeira and saved eight other crew members. Only the first mate perished, pulled down with the ship as he tried to climb the mizzenmast and jump to safety. 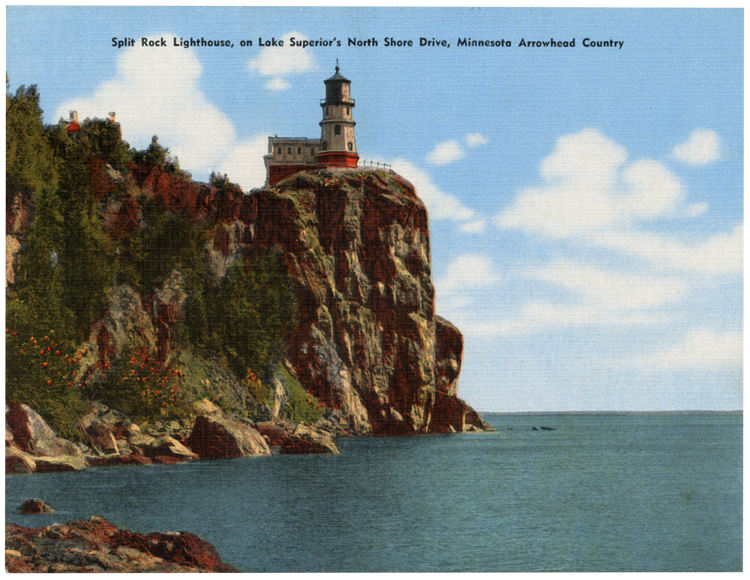 The need for the lighthouse along the rocky shoreline near the Split Rock River—then considered “the most dangerous piece of water in the world”—was bolstered by the wrecks of the Lafayette and Manila during the same storm. Soon after, a local delegation went to Washington, D.C. to state its case, and in 1907 Congress appropriated $75,000 for a lighthouse and fog signal near the Split Rock. Immigrant workers built Split Rock Lighthouse, a fifty-four-foot octagonal brick tower, between 1909 and 1910. The lens, a bivalve third-order Fresnel, was set in motion on July 31, 1910, after the lighthouse’s first keeper, Orrin “Pete” Young, lit the incandescent oil vapor lamp for the first time. From its position high atop a North Shore cliff, the lighthouse’s lens had a focal plane of 168 feet, the highest of all lights on the Great Lakes. By 1939 it was considered the most visited lighthouse in the U.S. and is still one of the North Shore’s most popular tourist attractions.